Tabula Rasa Multidisciplinary Experiment started as a celebration of a new event space opening up in Union Square, now called Warehouse XI. The project has since taken on a life of its own, as it fulfills a need, as expressed by many artists who have taken part, to work across the usual boundaries that divide the performing arts. 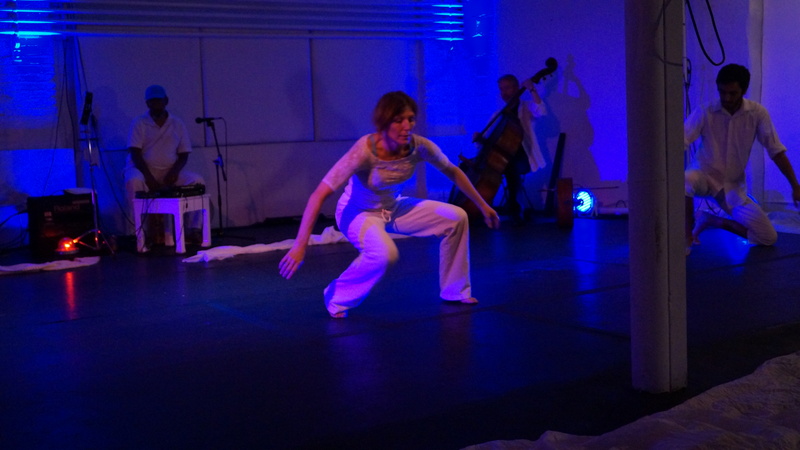 The improvisational and cross-disciplinary aspects of Tabula Rasa Multidisciplinary Experiments reflect interests that have emerged in me over many years as a performing artist. As a dance performer I missed the electricity of live music when dancing to recorded music. I always looked to the visual arts for inspiration, and have an amateur painting practice of my own. I have delved into video production, 2- and 3D animation, music, theater and other art forms, finding the disciplines draw important lessons and inspirations from one other. Improvisation has also become my favorite mode of performance, in part because of the difficulty of holding on to choreographic inspirations. I found it hard to trap movements inside repeatable phrases in a way that preserved the quality of the original improvisational research. I also felt choreography lacked the excitement of improvised movement, both in doing and watching. Structuring improvisations provides a compromise between overdetermining choreographic movement on the one hand and undisciplined, random movement for movement’ssake on the other. A typical Tabula Rasa performance “experiment” invites audiences into the warehouse as finishing touches are made to the stage, so as not to hide any aspect of the process. Todd Sargent, the lighting designer, may focus a few lights, dancers and musicians warm up, and the artist sets up her onstage canvas and paints. When everyone has settled, the stage lights come on and the performance begins. We dance with and without planned structures, the musicians both follow and lead the dancers, and the artist paints the scene. A videographer shoots from a camera whose signal is fed into a computer program that filters and alters the video in various ways: delaying, thresholding, recoloring, cartooning or layering it, and then a projector shines the result on the wall over the action. The first half of the show unfolds. After a brief intermission, artists in the audience are invited to participate in the second half. Visual artists in the audience are provided tables and water with which to paint, and photographers and videographers have the freedom to roam. Tabula Rasa Multidisciplinary Experiment has attracted artists and audiences with a keen interest in cross-discipline improvisation. I am pleased to have provided them and myself with the place and premise of Tabula Rasa. I still find myself searching for ways to rein the chaos that occasionally results when ten artists in a space each listens to his or her own muse. In 2017 my goal for Tabula Rasa Multidisciplinary Experiment is to continue the quest for the delicate balance between structure and spontaneity.